An exclusive adventure around hidden areas of Central Himalaya to holy Bhairab Kund. Bhairab Kund Trekking, an elusive and exceptional adventure on the hidden areas of Central Himalaya within Jugal range of mountains with Langtang Himal in the east with Bhairab and Gaurishankar Himal straight north from Bhairab Kund, hidden between dense woodland and high peaks. Bhairab Kund Trekking which leads you to experience perfect ambiance and pure wilderness environment on this over a week trekking, where all types of interested people can join in this fascinating and wonderful adventure which leads you close to the border of Nepal and Tibet with incredible scenery of peaks within Tibet includes Mt. Dorje Lakpa above 6,966 m, with Madiya 6,257 m and Phurbi Ghhyachu Himal at 6,637m. Truly an adventure worth the hard and tough walks on ups and downhill within high hills and valley covered in dense forest of tall rhododendron, oaks, magnolia and pine tree lines and walking into quaint hill villages of great interesting culture and simple traditional farm life which makes this trek more interesting and worth a visit to holy Bhairab Kund the highest spot of the trek at above 4,250 m.
Bhairab Kund regarded as one of the Most-holy spots in all Himalaya regions where Hindu believes that a dip and bathe in the icy pond relinquish the sin of hundred lifetimes, once a year a great religious event takes place in the month of August as per Hindu Lunar calendar. Starting with the exciting overland journey on Nepal-Tibet / China old highway to reach our starting point of the trek and then heading higher past interesting villages and into the pure wilderness beyond human life and villages on the road to Bhairab Kund with stunning views of peaks on walks. 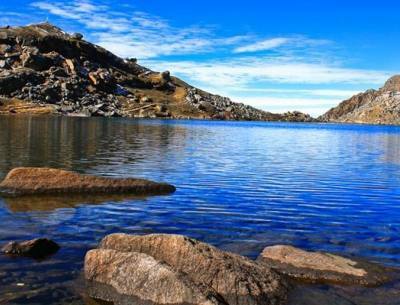 after a great marvelous walks reaching at Bhairab glacial pond with fabulous time to explore its beautiful undisturbed surrounding then heading back to the road ahead for the drive into hustle and bustle city life of Kathmandu with mesmerizing and adventurous time on Bhairab Kund Trekking. 1Arrive in Kathmandu via respective airlines and transfer to hotel. On arrival at Kathmandu international airport, you will be well received by Reasonable Treks & Tour staff and guide and then transfer you to your hotels within the hub of Kathmandu city around the most happening and exciting place around Thamel. The evening after checking into your rooms with refreshment our guides will brief regarding Bhairab Kund Trekking with welcome dinner in a nice authentic Nepalese restaurant with culture show. 2In Kathmandu sightseeing afternoon free preparation for the trek.The morning after breakfast leave for our exciting cultural and historical tour around Nepal's best World Heritage Sites which includes old Durbar Square (Palace Courtyard), Old Swayambhunath Stupa and other places of interest. after an interesting tour afternoon free to relax as well prepared for next day adventure on Bhairab Kund Trekking. 3Drive to Jalbire 1, 020 m - 04 hrs journeys.The morning after hearty breakfast where an exciting drive leads you on Kodari was also known as Kathmandu-Lhasa or Friendship highway which connects Nepal and Tibet / China, as the journey continues heading past Kathmandu Valley to reach Dolalghat by the Sun-Kosi River after Dolalghat drives towards North East at Balephi town near Nepal and Tibet border. 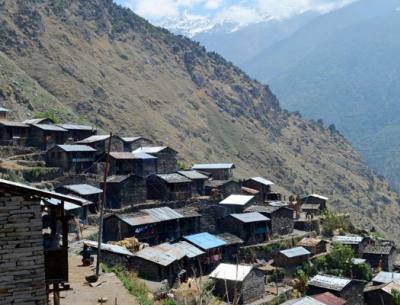 from here drive leads on dirt, rough road to Jalbire following upper Bhote Kosi River upstream to reach our first overnight halt at Jalbire, a nice Newari village situated on the bank of Balephi River, here with time to observe the old Newar culture and visit Lord Vishnu Temple. 4Trek to Chanaute 1,350 m - 05 hrs.Starting our first day walk to reach at Chanute, as our route follows past Tamang farm villages with views of waterfalls, and then reaching Chanaute, a small and lovely farm village inhabited by Hindu people Brahmins and Chettris people, overnight near local school premises where you can relax and enjoy views of mountains. 5Trek to Khanigaon 2000m - 06 hrs.The second-day walk begins with the interesting long day of about six hours from Chanute to reach Khani Gaon, where route leads up with narrow path past farm villages and schools, and then reaching at Khani Gaon as our tough day of long walk ends on this Newar village. The place also called as DallePokhari after its ‘small pond’ placed in a hollow by the school premises. 6Trek to Forest Camp 3,150m - 07 hrs.Morning leads to steep climb into cool forested areas with full of rhododendron trees, as our walk turns strenuous with uphill, enjoy wonderful time within serene surrounding in complete tranquility of forested area, as our route leads past several cow-herders and Sheppard's huts with some chances spotting some wildlife on this least visited area by trekkers, after a nice day walk overnight camp is set in the middle of forest. 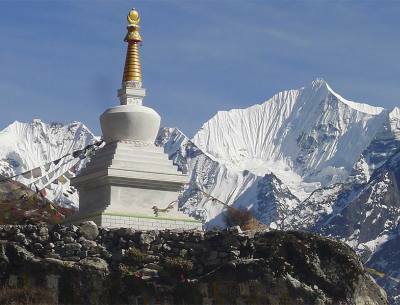 7Trek to Pati 3,765 m - 05 hrs.From the forest, camp walk leads to a steep climb with short breaks in between and the final walk to reach on a ridge top, which offers the stunning panorama of landscapes with snowcapped peaks. after a long climb reaching at Pati for the overnight stop with views of the mountain range, this area a resting place for pilgrims on their way to holy Bhairab Kund on auspicious time as per Hindu calendar. 8Trek to Bhairab Kund 4,250 m - 04 hrs.After breakfast, our walk leads to our final destination with the climb for the hour or more, then reaching a ridge top overlooking views of high peaks, from here than on gradual path for few hours to reach our highlights of the journey reaching at Bhairab Kund for the overnight stop. afternoon explore around to a hilltop for more views towards Jugal Himal range with Bhairab Kund, (Kund means ‘pond’) located 4,250m high, one of the sacred pilgrimage spots once a year in the months of July and August pilgrims visit the temple at Bhairab Kund as the shrine dedicated to Lord Bhairab one of the many manifestations of Lord Shiva, where a bathe in the holy pond, washes the sins of a hundred lifetimes. 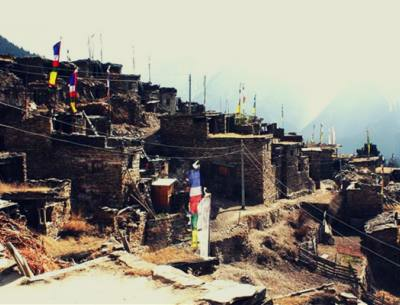 9Trek to Sherpa Gaon 2,500m - 06 hrs.Early morning catch the stunning sunrise, and then depart from this holy place with the uphill walk for two hours, and then reaching hilltop with views of Langtang, Jugal Himal and peaks of Rolwaling range includes the mountain of Tibet side. after a lovely morning views heading back downhill for six hours into the forest to reach at Sherpa Goan for the overnight stop, a small farm village of Sherpa tribe the Highlanders of Himalaya. 10Trek to Larche 1,500m visit hot spring - 05 hrs.Today, last day of this marvelous walk and adventure as our route follows the downhill path for some hours to reach the bank of Bhote Kosi River and to reach our last overnight stop at Larche village located nearby natural hot spring where you can relax after a great walk. 11Drive to Kathmandu - 05 hrs.With overwhelming experience and adventure at Bhairab Kund, our fabulous adventure completes taking an interesting and scenic drive back to Kathmandu of five hours journey, on reaching Kathmandu transfer to your respective hotels with the afternoon free for individual activities. 12International Departure for Homeward bound.As per your international flight time transfer towards Tribhuvan International Airport for the journey back home or to respective destinations after a super and amazing time in Nepal Himalaya on Bhairab Kund Trekking.